Scientific Results to Support the Sustainable Use and Conservation of Marine Life is designed to help policy makers determine how results of the first Census of Marine Life might be used to craft science-based policy. The report complements the 2010 Highlights Report and summarizes the discoveries, tools and technologies from the decade-long Census of Marine Life that are most relevant to policy makers, resource managers, and government officials. 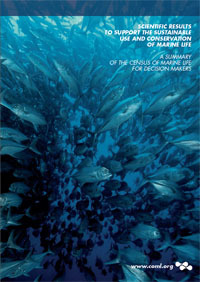 Included are examples and data that can help inform decisions about ecosystem and species level protection, discusses findings about marine habitat degradation and rehabilitation and introduces Census-developed tools to identify biodiversity hotspots and large-scale ecological patterns and analyze distributions of species over time and space. The report is available in seven languages.